Effective 1 January 2019, Swissport International AG will consolidate its existing regional structure from nine management regions to three. Glenn Rutherford, currently in charge of Swissport in Australia and New Zealand, has been appointed to a new role heading up the greater Asia-Pacific region (APAC). As Executive Vice President Asia Pacific, Glenn will join Swissport Group Executive Management and report to Eric Born, Swissport President & CEO. “Our refined organisational setup brings executive management closer to our customers and our operations. More accountability will be delegated into the enlarged regions. The regional heads and their management teams will take full responsibility for commercial matters,” Eric Born explained. Replacing Glenn Rutherford as head of Australia and New Zealand is current Pacific Region COO Rob D’Alessio, appointed to the role of Senior Vice President Pacific commencing 1 January 2019. Glenn Rutherford explained that planning had been underway several years for such a change and that Rob D’Alessio was a natural successor. Rob has led ground handling, cleaning, cargo, bussing and trolley operations since joining the business in early 2015, and following 15 years in ground operations at Virgin Australia. 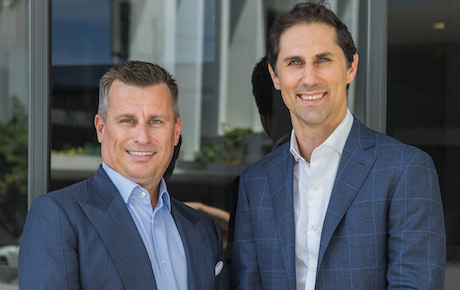 “Over the past almost four years, Rob has demonstrated his leadership and strategic and financial acumen and has earned the respect of our local team, Swissport management and the aviation community,” Rutherford said. “Rob has a clear direction for delivering continued excellence in safety, service and performance. I know that our business in Australia and New Zealand is in extremely good hands and we are both keen for the challenges and opportunities ahead. As the existing global setup with nine regional management teams will be consolidated into three areas, the Regional Heads will replace the Chief Operating Officer at group level. The responsibilities of the Chief Commercial Officer will largely move to the regional level for closer client relationships and market proximity. The new EMEA region with Europe, the Middle East and Africa, will be managed by Luzius Wirth, currently Executive Vice President UK & Ireland. Joe Phelan, currently Group Chief Operating Officer, will temporarily head the Americas Region, until a permanent candidate is appointed. The new global structure is part of a scheduled succession plan. Joe Phelan, Group Chief Operating Officer, and Nils Pries Knudsen, Group Chief Commercial Officer, will retire in the first half of 2019. Further details are available on the Swissport Group website. Swissport International AG, on behalf of more than 850 client-companies, provides best-in-class airport ground services for some 265 million passengers annually and handles approximately 4.7 million tons of air cargo at 134 warehouses world-wide. With a workforce of some 68,000, the world’s leading provider of airport ground services and air cargo handling, is active at over 300 airports in 50 countries on six continents. In 2017 the Group generated consolidated operating revenue of EUR 2.8 billion.